Sephora Honeymoon Splurge Wish List! - Sugar, Darling? Sephora Honeymoon Splurge Wish List! You don't need to be a genius to figure out that I flipping love make up. I wear it every single day (other than the odd Sunday that I spend at home, just Pete and I) and I'd never dream to leaving the house without at least foundation and mascara on. I know it's not for everyone but it makes me feel confident and beautiful and so I'll carry on that way forever! I also love how artistic you can get conjuring up endless looks and using your creative skills to put together interesting colour combinations and even different shapes for your lips, shadows and event face if you're a contouring whizz! As we're off to the US this weekend I've saved up over the last few months so I can have a mega splurge in Sephora as they carry lots of brands and special edition products that aren't available in the UK. I've already planned most of my purchases so I thought I'd share with you my wish list! Remember Sephora now ship to the UK too so even if you're not making a transatlantic trip anytime soon you can still get your mitts on these items! Why not club together with a make up loving friend or two so you can split the shipping cost? First up I'm going to be massively adding to my collection of Kat Von D lipsticks! I have a few now in the old packaging and formula but I'm so excited to be able to grab some of the new style Studded Kiss Lipsticks! They're priced at $21 each which works out at around £13.50. The colours above are the ones I'm hoping to grab - from top left they are Poe, Motorhead, Homegirl, Wolvesmouth, Wonderchilde, Lullabye, Countess and Lovecraft. I'm also going to be buying some other KVD products while I'm there, first up I've always wanted to try her Lock-It Tattoo Foundation ($35/£22.50) as I've heard it has great coverage and stays put all day long. I'll also be grabbing several of her Everlasting Liquid Lipsticks ($20/£12.85) as I adore this kind of lippy cause it means I can put it on and not have to worry about it for the rest of the day! The colours above are Vampira, Bachelorette, Underage Red, A-Go-Go and Berlin. I'm also going to stock up on another tube of the High Voltage Eye Primer ($15/£9.65) which I tried in it's old form of a tube with a doe's foot applicator and loved, so hopefully the newly packaged version is just as good! My final KVD purchase I think will be the Innerstellar Eyeshadow Palette ($46/£29.50) as I love all of the shades and my other KVD palettes are some of my favourites that I own. Thanks to the handy currency conversion acting in my favour I'll also be snagging some Hourglass products, specifically the Ambient Lighting Palette ($58/£37.20) and the Ambient Lighting Blush in Mood Exposure ($35/£22.50). I've also been eyeing up this stila Eyes Are the Window Palette in Soul ($49/£31.50) but I want to see the shade range in person before I commit. Besame is a brand that I've loved from afar for a long while now and the product I've been most desperate to try is their Brightening Violet Powder ($22/£14.10) that is meant to leave you with a porcelain like matte finish. Another palette that I might make my own is the Laura Mercier Eye Art Artist's Palette ($55/£35.30) - as you can tell from my picks I'm really into purpley pinky neutrals at the moment and these shades all look just divine. I've heard a few bloggers talking about the Lights, Camera, Lashes Mascara by tarte and so I think I'm going to grab the Duo Set ($20/£12.85) while I'm at the counter so I can give it a try for myself. 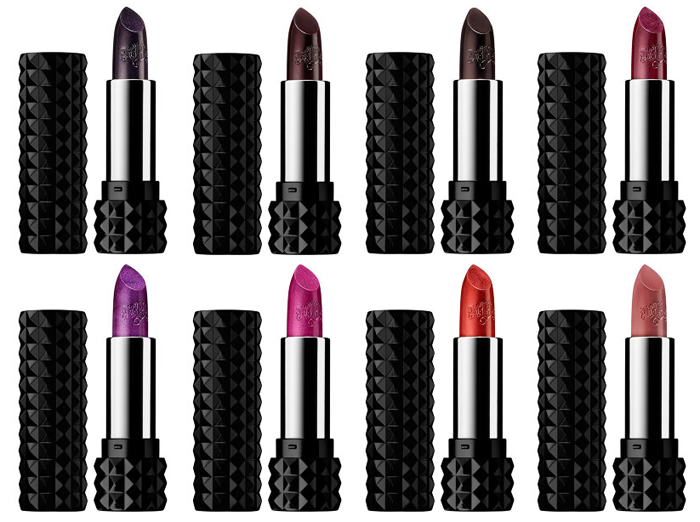 Last but not least my friend Sophia of Tattooed Tealady has informed me how great Sephora's own brand products are and so I'm going to give one of their Lustre Matte Long Wear Lip Colours ($16/£10.30) a go - the shade I like best is Deep Plum. Are you a make up fiend too?